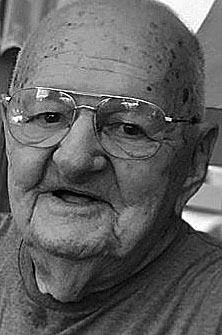 Charles “LaRue” Merrill, 90, of Shirk Hollow, passed away peacefully at his home on Sunday March 3, 2019. His last days on Earth were spent surrounded by his closest family and friends. He was born on Aug. 30, 1928, the son of the late James and Erma (Bardo) Merrill. He was the oldest of four children. He is survived by his brother, Robert (Judith) Merrill, Leotta (Gene) Summerson, and Velma (Harold) Shoemaker. He worked various jobs throughout his life, but retired from Alcan Cable after many dedicated years as a foreman. He was known by many as “Pap” or “Pop” to most. He welcomed everyone into his home and was a father figure to so many. His favorite past times included putting many, many miles on his car from going on rides, going to Wal-Mart almost every evening, sitting on his porch watching his bird feeders, and watching his favorite TV show, Family Feud. Pap was an avid hunter and loved everything about the great outdoors. Most of all though, he loved his family and spending time with them. He was preceded in death by a son, Charles Merrill, Jr., and a grandson, Carl Merrill, Sr. Surviving are his former spouse, Jean Merrill, and their children, Carleen, Beverly, and Paul (Dixie) Merrill, Marilyn (Alvin) George, Kathleen Merrill (Dennis Winner), and Valerie (Robert) Johnston. His grandchildren include: Colton Confer, Amber, Kassie, and Chase Johnston, Cody and Abby Bradley, Seth and Heather Miller, Brice and Hannah Royer, Catherine Merrill and Caitlin Hopkins, Carl, Brittany, and Cierra Merrill, Christine and Clint Dorman, Curissa Ertwine, Dekota Welker, Alvin George III, Jennifer, Chad, and Jessica Jeirles, Keith and Megan Merrill, Stacey Bowes, Shane (Brenda) Merrill and family, Shawn (Christine) Merrill and family, Travis (Brenda) George and family, Alvin Jr (Evie) George and family, Melony Merrill and family; along with a billion other great and great-great grandchildren. Viewing services for friends and family will be held on Thursday March 7th from 6 – 8 p.m.
Funeral services will follow on Friday, March 8th at 11 a.m. with Pastor Jay Saldana officiating. Both services will be held at Swissdale United Methodist Church, 974 Croak Hollow Road, Lock Haven, Pa. 17745. In lieu of flowers, memorial contributions may be made to Swissdale United Methodist Church. Arrangements are under the direction of the Donald G. Walker Funeral Home, Inc., 231 High St., Flemington, Pa. 17745. Online condolences may be sent by visiting www.donaldwalkerfuneralhome.com.